Capable of snapping at the heels of exotica with its 4.3-second 0-62mph sprint time and potential top speed of up to 174mph, the new five-door, five-seat Sportback will weigh in at £39,950 OTR. It will become available to order in March and reach its first UK customers in the summer. With a power-to-weight ratio of 241PS per ton achieved by trimming an additional 55kg compared with the previous RS 3 Sportback, the latest car needs just 4.3 seconds to hit 62mph from rest, and with a suitable stretch of Autobahn to hand could continue to an electronically governed 155mph top speed. Drivers looking for optimal performance can also specify an optional increase to 174mph going through all four wheels. Compliance with stringent EU6 emissions legislation confirms that the latest edition of the classic five-cylinder unit is as frugal as it is feisty. With the help of a recuperation system, a demand-controlled oil pump and a new generation start-stop facility which increases the duration of engine ‘downtime’ at each stop, the latest RS model is capable of returning up to 34.8mpg, corresponding to CO2emissions of 189g/km. Butterfly valves in the exhaust system control the exhaust flow and deliver a suitably full-bodied and characterful note that varies with engine load and speed. A seven-speed S tronic twin-clutch transmission reworked to offer even faster shifts directs the power to the quattro permanent all-wheel drive system with its redesigned and lightened multi-plate clutch and torque vectoring capability. 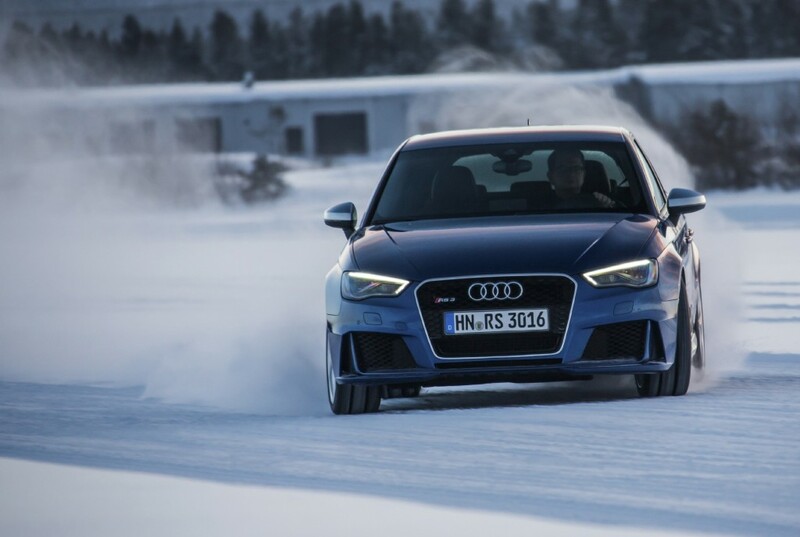 The clutch is mounted on the rear axle in the interest of balanced load distribution, and the parameters its bespoke RS 3 software works to can be controlled via the Audi drive select system. Depending on the situation, it can send between 50 and 100 percent of the available torque to the rear axle, and when Audi drive select is in dynamic mode and the ESC Electronic Stabilisation Control system is in its sport setting, power is transferred to the rear sooner and in greater amounts for even greater agility and more direct turn-in. The state-of-the-art all-wheel-drive system adds a further measure of control and composure to the inherently agile RS-specific chassis with its wider track front and rear, uprated MacPherson strut front suspension with purpose-built lightweight aluminium pivot bearings and four-link rear set-up. The new electromechanical progressive steering system which is capable of varying its ratio as a function of steering input also helps to emphasise the quick-witted feel. From the driver-focused section of the options list the Audi magnetic ride adaptive damper system can be added to level out ride and handling to an even greater degree, and the steadfast RS-specific disc brakes with their efficiency-boosting wave contour discs, eight-piston calipers and bespoke lightweight friction rings upfront can be further upgraded with carbon fibre-ceramic front brake discs – a first for a car at this level. Classic RS visual references signal the special qualities that all these features confer to the outside world. In UK specification versions the nose with its high-gloss black, honeycomb-look singleframe grille and pronounced air intakes is set off by standard LED headlamps and daytime running lights. In profile the standard 19-inch alloy wheels snugly filling their arches, flared front wings, chiselled sills, matt aluminium-look mirror housings and large roof spoiler also catch the eye, and the rear with its remodelled bumper and high-gloss black diffuser insert is dominated in each corner by a large, oval RS tailpipe. Customers can choose from a palette of eight paint finishes to either accentuate or subtly play down the purposeful look – it includes the two new shades Nardo grey and Catalunya red, metallic, the latter available exclusively for the RS 3 Sportback. In the equally focused interior the standard sports seats are upholstered in Fine Nappa leather with contrasting stitching in rock grey, and the driver’s is perfectly positioned in relation to the flat-bottomed RS multifunction sports steering wheel with its leather and Alcantara trim. Stainless steel pedals, Alcantara door inserts and inlays in either 3D design black or optional Aluminium Race or Carbon also signal intent. High-quality applications in gloss anthracite black frame the instruments, which include black-faced dials with red needles and white scales, plus a driver‘s information system enhanced by a boost pressure indicator, an oil temperature gauge and a lap timer. In addition to LED headlights, standard equipment highlights for UK RS 3 Sportback models include the acclaimed MMI radio with its electrically folding colour screen, navigation preparation, Audi Music Interface iPod connection, Bluetooth mobile phone connectivity, front seat heating and the parking system plus with acoustic and visual guidance. Choice options include newly developed RS bucket seats bringing a 7kg weight saving over the standard sports seat, an RS 3 interior design package with red accents on the seats, knee pads, air vents, floor mats and seat belts and MMI navigation plus with MMI touch, which through its Audi connect function beams internet-based services to the car. This entry was posted in Car Updates & Releases, News and Views, Performance Car, Small Car, Sports Car and tagged audi rs3, Audi RS3 Sportback by David Petherick. Bookmark the permalink.